Sima Habrawi from UAE joined Dental internship in Palampur, India. In her interview, she tells us why she chose India as her internship destination, her experience of the internship in India and what advice she would give to other people looking to intern in India. Why did you choose India as your internship destination? How was the experience for you? This was a life changing experience on both personal and medical aspects. I chose this destination because I have always considered India as a very interesting and spiritual country to visit due to the diversity in religions, languages, and cultures. I also wanted to explore India not just as a tourist but also as a healer and a helping hand. What differences do you between dental care in India and dental care in your country? The beauty of medicine and dentistry is that it is the same no matter where you go. The basics of knowledge, Medical terminologies, and the scientific fundamentals or pillars are the same. I noticed a few differences in the way of using certain instruments and differences in some techniques which definitely added to my knowledge and expanded my experience. At the end of the day, there are multiple schools of dentistry and different ways to do one thing but the outcome of relieving pain and improving dental health is the goal in all schools around the globe. How was it like working in the camps? Any particular experience that you would want to share? Medicine is advancing quickly and technology is being integrated into the medical fields greatly resulting in huge advancements that make procedures faster and more efficient. In camps, you are limited to hand instruments and basic treatments or procedures. The environment is not ideal and going back to the basics of dentistry with minimal instruments, regular chairs, not a reclining dental unit, and poor lighting was challenging but also rewarding; because I discovered that even with basic instruments a proper treatment can be done. I was able to save many teeth with just simple procedures. 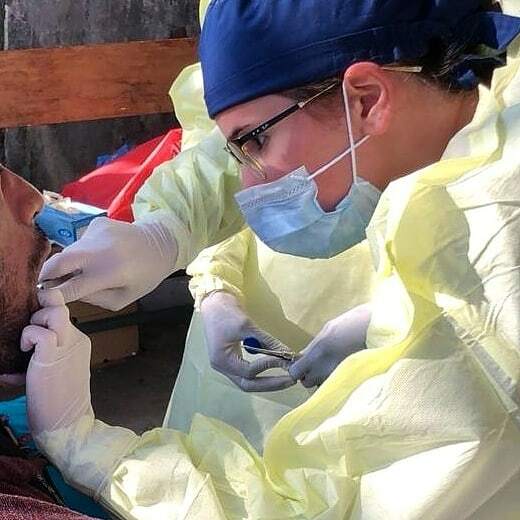 I was also able to guide many patients about their current oral cavity status, their dental problems, oral hygiene and bring their attention to problems that are beyond what we can handle in a camp. Being in camps teaches you how to maximize your abilities and use whatever you have to provide the best treatment possible. It simply rekindles the creativity in you. Volunteering is not all work and no fun; that is the misconception people have! We had enough free time to enjoy Palampur like proper tourists, we also drove up the mid-region of the Himalayas and went for a small hike where snow covered some regions of the mountains, we walked through the tea gardens and got a tour of the tea factory. We also had one day to spend in McLeodGanj, the city of Buddhist monks and the residence of his holiness the Dalai Lama. Any words of wisdom/recommendations that you have for future interns? It might seem very challenging for someone to apply for a mission trip in a country abroad, a million thoughts will cross your mind when you think of signing up for such a thing. Trust me, this trip has been an amazing experience and a life-changing one! It changed me and made me more capable of working under different conditions and with people I just met. I'm sure this won't be my last trip! Sign up for the next mission trip, I guarantee you won't regret it!